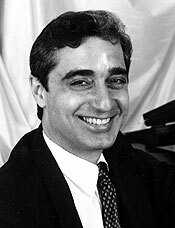 Born in Detroit, Michael Pilafian holds degrees in music history from the University of Michigan and piano accompaniment from Eastern Michigan University. He is currently pianist for New Jersey Verismo Opera, Taconic Opera, Gateway Classical Music Society, the Liederkranz Chorus, and Manhattan College. For the past fifteen years, he has directed the Pilafian Ensemble, a vocal and instrumental chamber-music group. From 2004 to 2014, he served as pianist for Maestro Vincent LaSelva, both for classes taught by him in The Juilliard School´s Evening Division and for the New York Grand Opera. In the same period, he was pianist for the Center for Contemporary Opera, and has also played for the Bronx Opera, Queens Opera, and Island Lyric Opera. For ten years, Mr. Pilafian was the pianist and music director of the Richard Flusser´s After Dinner Opera, and has played concerts in twenty-six countries with Opera New York, the Ambassadors of Opera, and Karlsrud Concerts. He has played in the vocal studios of Carolina Segrera, Rita Patané, Renata Scotto, Licia Albanese, Enrico DiGiuseppe, Loretta DiFranco, Regina Resnick, Ellen Repp, Teresa Stratas, Mario Bertolino, Michele Farruggia, Felix Knight, Gustava Weiss, Vivian Mordo, Gustavo Lopez-Manzitti, amd Patricia Racette. In addition, he has also improvised piano music for classes at the Martha Graham School of Contemporary Dance and at the New York School of Ballet. For seventeen years was organist and music director at the Church of the Covenant and has played organ at the Church Center for the United Nations. Mr. Pilafian’s musical compositions have been performed at the Salmagundi Club and the Church of the Transfiguration, and at the Church of Our Lady of Mercy with His Eminence, Timothy Cardinal Dolan, Archbishop of New York presiding, for its anniversary mass.